During the summer months, when Mother was busy with her preserves, we could never be sure which of the many delightful aromas we’d encounter in the old kitchen. It might be fresh tomatoes stewing and simmering away or the sharp scent of the chili sauce. If the cucumbers were ready in the garden, we’d smell dill or onions or sweet mustard boiling on top of the stove. My favourite scents were the berries – raspberries, strawberries and sometimes strawberry-rhubarb. Preserving the fruits or vegetables from the garden was a necessary task in the summer months with so many hungry kids in the house. Jars would be filled, labelled and stored in the pantry in neat rows on shelves and the extras lined up along the floor. Pickles, vegetables and jams were a welcome sight mid-winter when the fresh crops from the garden were a faded memory. Imagine coming down the stairs on a cold winter morning, walking across the chilly floor, a layer of ice on the inside of the windows and then seeing a mason jar of homemade jam in the middle of the kitchen table. It was as though the spirit of summer was brought back to life after its long wait in the pantry. The toast would pop up and the jam would be spread generously on the thick slices of homemade bread. The berries, picked at their peak of perfection tasted sweet and fresh and were a temporary escape from the harsh weather that lay waiting outside the kitchen walls. The preserves at our house were never complicated and the ingredients were basic. There was no extra money for fancy additions to the recipes, so they contained only things at hand. Because of their simplicity, they retained the true flavour of the vegetable or fruit and it was as though the essence of the harvest was captured and frozen in time in those precious little jars. 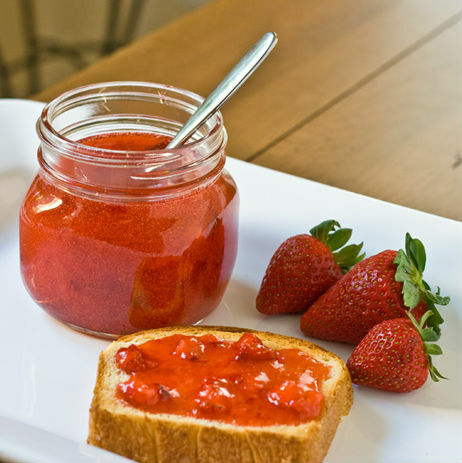 The Strawberry Jam recipe that follows contains only three ingredients – strawberries, sugar and lemon juice. It is simple to make and will keep for a year if stored in a cool place. It also doesn’t require any fancy ‘gear’ to make it. We had no special pots or kitchen ‘machines’ at home and yet year after year Mother managed to win prizes at the local fairs with her simple recipes. 2 pounds of fruit – strawberries, raspberries, peaches, etc. Before you get started, boil your mason jars for ten minutes and let them dry upside down on a towel. Remove, label if desired, store in a cool, dark place for up to one year. This entry was posted in Short Stories and tagged lanark county, strawberry jam. Yum, the fragrance of jams or pickles was lovely. I did love the jams but I think my favourite was the mustard pickles Mother used to make. In my first life, out in my big garden on the acre in Greely, I grew lots of cucumbers and I made a lot pickles including the mustard pickles. Last summer, much to my surprise and delight a friend made some and gave me a jar. What a treat that was. The local raspberries are in the stores now and after reading about jams I think I may just make up a batch of jam. I’ve never used the recipe so it’s a good time to give it a try. Thanks for the timely reminder. My favourites were the bread and butter pickles and the chili sauce. I think everyone made their own jams and jellies in those days. When Mother had some leftover pastry she’d put a little dab of jam and fold the pastry over and make a few little tarts. They were heavenly!